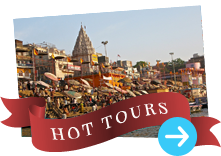 Banaras has always been associated with philosophy and wisdom. A place of learning for many years, the Banaras Hindu University carries on this tradition. The University campus, to the south of the city, was built at the beginning of this century. Pundit Madan Mohan Malviya was instrumental in founding it. On campus is the Bharat Kala Bhavan Museum, which originated from the private collection of Rai Krishnadasa. In Banaras we find many places where a temple once stood and where now mosque or some other structure stands. However, there is a little known farman, or royal decree, in the Bharat Kala Bhavan museum, which claims that Aurangzeb, the last great Mughal ruler, ordered his administrators to abstain from destroying any more temples. 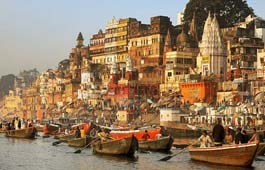 In succeeding years as Banaras continued to grow, the temples that were destroyed, were rebuilt or relocated. 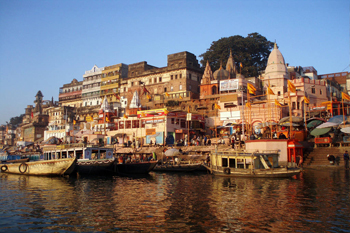 The inflow of pilgrims developed Banaras as a trade centre. Besides traders, crafts people also settled in Banaras. Today the city is renowned for its silk weavers, who prepare the finest types of woven silk fabrics. A Banaras silk sari or shawl is traditionally a single colored textile with motifs and patterns woven in gold or silver threads. The technique is intricate, the procedure complex and demands great expertise .As the warp and the weft are interwoven on the loom, small ,often minute shuttles with gold thread are introduced to form the motif. When the design of the motif is completed, a knot is made and the gold thread cut. The weaving continues until the next design. The smaller the motif or the more intricate the design, the more complex the weaving skills required. Silk weaving in Banaras is a cottage industry and in many areas of the city, especially the Muslim quarters, one can see looms at work all day . Entire families are involved, Children often pick up the art from the elders at an early age. There are shops in Banaras, and throughout India, that sell these fine silk fabrics.